A pianist, bandleader, and composer, Dave Brubeck (1920-2012) is widely acknowledged as one of America's most significant post-Swing Era jazz musicians. He added new dimensions to jazz composition and created a body of music that was bold and accessible. Growing new audiences with a sophisticated, swinging style, he further extended jazz's domain by bringing the music to college campuses nationwide. His appearance on the cover of Time magazine in 1954 asserted his status as an American superstar and four years later, a far-ranging US State Department tour of his eponymous quartet to countries in Eastern Europe, the Middle East, and Southern Asia, gave Brubeck the opportunity to serve as a cultural ambassador. On this and many other subsequent government-sponsored trips, Brubeck and his collaborators presented jazz as an intentional and accurate reflection of the highest American ideals and cultural aspirations. In 1959, the Dave Brubeck Quartet's complex and iconic Time Out was a blockbuster hit, unusual for serious jazz, then and now. Recognized as a key proponent of a sub-genre named "Cool" (also identified as "West Coast"), Brubeck was an original in a variety of forms, composing oratorios and cantatas, as well as compositions for ballet, musical theater, and symphonic orchestras. A socially engaged artist, Brubeck consistently fought for racial integration and equality both at home and abroad during times when it was not the popular thing to do. While serving in the US Army, Brubeck organized the Wolf Pack, a racially integrated music group in America's then segregated armed forces. Brubeck remained steadfast in his commitment to racial equality throughout his career. In the 1950s he insisted on performing with the regular members of his quartet, even when college administrations requested that African American bassist Eugene Wright not appear. Similarly, Brubeck left the stage of a live television recording when it became apparent that the director had requested that Wright not appear on film. Brubeck regularly declined opportunities to play for segregated audiences in the American South in the 1950s and 60s and, in 1976, showed the same courtesy to the nation of South Africa. Brubeck's political and ethical beliefs were clearly expressed in the musical theater piece, The Real Ambassadors, co-written with his wife Iola. The piece, which satirized segregation, never reached Broadway as intended, but was recorded in 1961; the following year a concert version of the musical was performed at the Monterey Jazz Festival in a production featuring Louis Armstrong. The exhibit features Brubeck's extensive career and his role as an prolific composer, innovative musician and international ambassador. The exhibit is part of the Dave Brubeck Festival April 8-10 in Memphis. 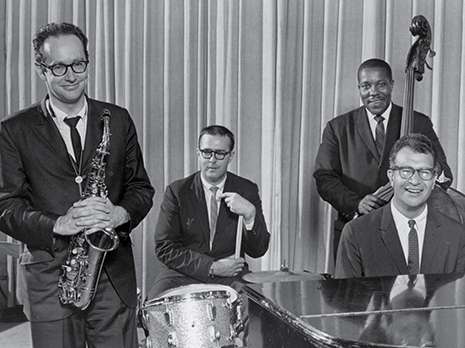 Dave Brubeck Quartet From left to right: Paul Desmond, Joe Morello, Eugene Wright, and Dave Brubeck, 1961. This ensemble is widely considered to be the "classic" iteration of the Dave Brubeck Quartet. 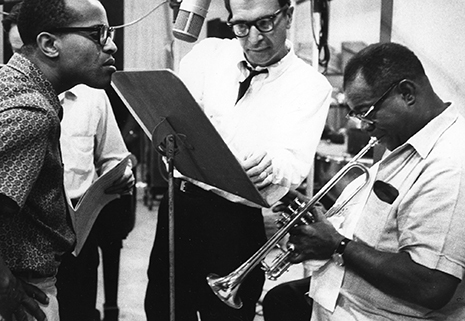 Dave Brubeck and Louis Armstrong at a rehearsal for the recording of The Real Ambassadors, Columbia Records studio, New York, 1961. 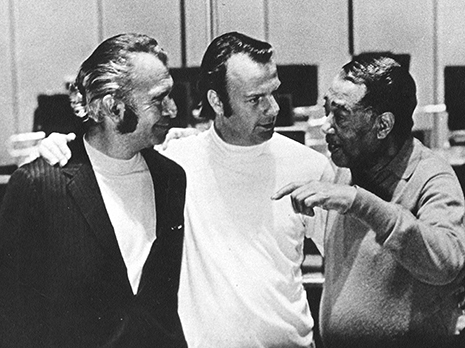 Recording Session Dave Brubeck (left), Erich Kunzel (center), and Duke Ellington (right), at a recording session for Dave Brubeck's The Gates of Justice, Cincinnati, 1969. 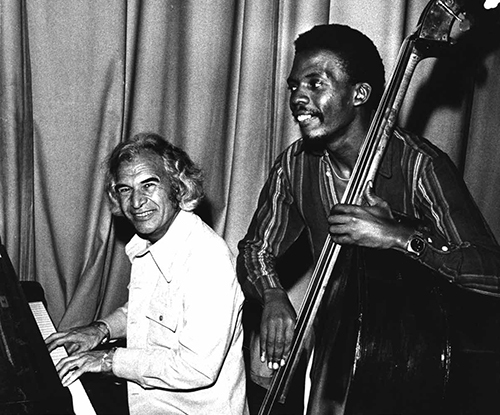 Performing in South Africa Dave Brubeck performing with Victor Ntoni in Johannesburg, South Africa, 1976.